Like most people, I spend the first week of a new year crafting goals for the upcoming months, compiling a list of things I’d like to accomplish. One (big) goal I had for 2017 was to do a solo adventure vacation. I spent several weeks researching and considering what sorts of day-trips and tours I’d like to do on my own, ultimately booking a week-long trip to Cusco, Peru! I worked with the tour company Elite Travel to help plan a customized itinerary. It was the perfect solution for a first-time solo female traveler. The focus of my trip was on exploring and immersing myself in the weaving culture and traditions of the region. Inspired by my ‘textile kick’ from last fall, it felt like the perfect way to utilize this solo trip; I could spend as much time as I wanted (read: a majority of my stay) on a design-oriented exploration. On the first day of my trip, my guide took me to the Awana Kancha living museum - an alpaca farm and weaving community. It was a great introduction to the different alpaca species in the region and I learned about different yarn dying practices/materials. I made the decision right there on the spot that my favorite type of alpaca was the Suri (they look like friendly mops!!). We then drove down to the valley of Pisac where I had a serious test of my Spanish in the textile market. First order of business: pick up an alpaca blanket and some yarn for my knitting-extraordinaire of a sister. The next leg of my trip was focused on visiting Aguas Calientes - the town of Machu Picchu. After the hectic prior days of village-hopping, altitude-acclimating, and touring, some downtime was just what I needed. The town is small, so it only took me a couple of hours to wander the streets and get the lay of the land. I focused mainly on eating stellar local specialties and bargaining in the local textile market...again (added another alpaca blanket to my collection!). Machu Picchu and the surrounding landscape were truly as incredible as everyone says. The ruins were impressive, and learning about the ancient Incans that lived there was fascinating. But soaking up the views and surroundings was what I spent most of my time doing once my tour group dispersed. Another bonus of solo travel: ample time for reflection and relaxation. Next came my absolute favorite part of the trip: a visit to the Patacancha community as part of a tour with the Awamaki organization. 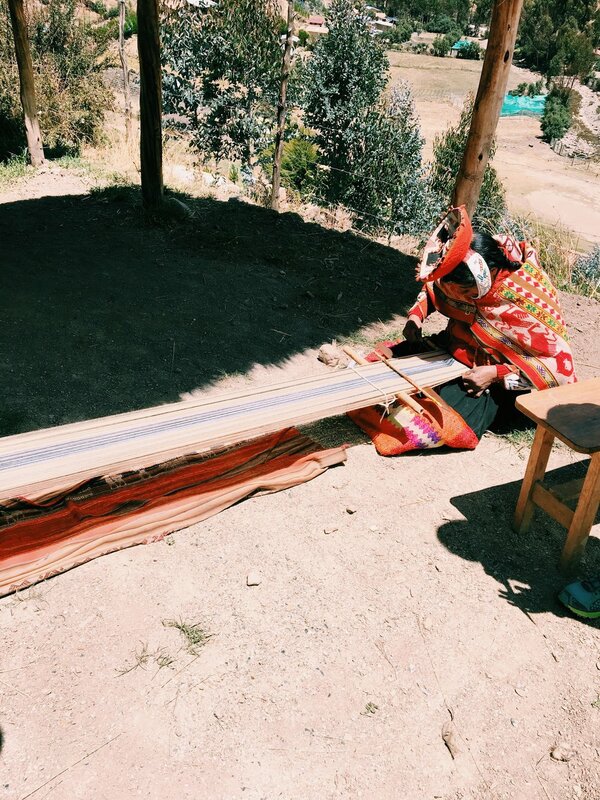 Awamaki is a group that works with women in local Andean villages to support their weaving traditions by empowering these women to start their own small businesses selling their pieces. It is a wonderful organization to support if you are looking for sustainable tourism activities; I highly recommend. The women were so gracious in demonstrating their techniques and I was able to complete a project along with them (!!!). I felt so honored to be welcomed into their community, meet their families, and ultimately their home over a home-cooked meal. My final days of the trip were spent in the city of Cusco, but not before visiting another weaving cooperative - Paqari Wasi - along the way. This community is unique in that they weave patterns on the edges of their work - often related to stories mapped out in the patterns of their larger pieces. I returned feeling refreshed and excited to have been so immersed in the culture and crafts of the Cusco communities. Doing this trip solo turned out to be the perfect way for me to experience the region - I was able to talk and work with my tour guides and hostesses in a more personal way by interacting one-on-one.